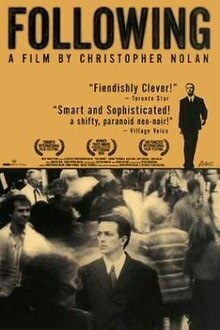 Twenty years ago, Christopher Nolan put out his directorial debut: Following. Don’t get it confused with the TV show starring Kevin Bacon. Of course, Nolan is a massive name nowadays. He can direct what he wants, and people will go out in their masses to watch it. It’s strange, in a way, that in the same year a fellow auteur released his debut. Darren Aronofsky released Pi (click here for my review! ), and the two have progressed in wildly different ways since 1998. However, both put out distinct films that have their own voice. And both debuted with rough and ready films, that whilst not quite masterpieces, showed oodles of potential (and the themes they’d follow for the duration of their careers). To reveal too much would ruin the story, but suffice to say, you are kept guessing until the very end. Nolan’s obsession with non-linearity starts here; the story is told by effect then cause, rather than the other way round. There are three acts, all visually distinctive with little clues, but they are all scrambled up. Yes, Nolan recently used non-linearityin Dunkirk, but I found that irritating and dull. Here, the non-linearity adds something intangible to the story. It’s disorientating. When you think you’ve figured everything out something else crops up t shatter your beliefs. The story takes classic noir tropes without adding anything novel, but it’s the structure of the film that’s the novelty (much like Memento). A major positive of Following is that it’s short. At 70 minutes, it’s a breeze! Of course, that’s due to its low budget nature. And that low-budget doesn’t reflect in the cinematography or the direction (both of which are impressive for a directorial debut! ), but it’s very noticeable in the sometimes rambling dialogue and the shoddy acting. Yes, I acknowledge that these aren’t top notch calibre actors. But ‘The Young Man’ often acts like he’s a college actor, doing some pseudo-serious drama in front of a small audience. The other characters aren’t much better. No matter how intricate the plotting, if the characters aren’t convincing, then how can you become involved with the story? Retroactively speaking, you can see the seeds of Nolan’s future films in Following. Non-linearity, as discussed above? Check. Complicated rules explained through rapid-fire but dry dialogue? Check. Obsessive main (male) character? Check! Thinly sketched out female character? Check! There’s even a Batman symbol visible on a flat door! Did Nolan predict the future? 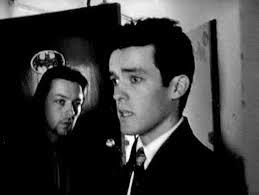 But that’s the real value of this film; to see Nolan’s roots. Intricate plotting may lead to future viewings, but mediocre actors and a lack of emotional connection undermine what could have been a masterpiece. VERDICT: 7/10. 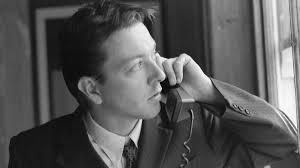 Nolan’s directorial debut exhibits all of his obsessions at an early stage. Yes, it may contain mediocre acting and a script that tells more than shows, but the non-linear narrative keeps you guessing right until the end. What did you think of Following (1998)? Leave your thoughts/comments below!